MAC Football News: DelVal Football - The Aggies take on Albright in MAC "Game of the Week"
DelVal Football - The Aggies take on Albright in MAC "Game of the Week"
DOYLESTOWN (PA) – The Delaware Valley University football team will take on an undefeated team for the second straight game when it travel to Reading, Pennsylvania to battle Albright College in a crucial Middle Atlantic Conference (MAC) contest on Saturday, October 24. Kickoff at Gene L. Shirk Stadium is set for 1:00 p.m. The Lions are the lone unbeaten team in the MAC and sit in first place with a 5-0 conference mark. Coming off the bye week, the Aggies are currently in a three-way tie for second with Stevenson University and defending champion Widener University. All three teams hold a 4-1 conference record. DelVal bumped its record to 5-1 overall with an 18-15 triumph over Stevenson on Homecoming & Family Weekend, handing the Mustangs their first loss of the campaign. The Aggies trailed 15-10 when they started a drive at the Stevenson 34 with 2:36 remaining. On the sixth play of the drive, junior wideout Tyler Bing (Galloway, NJ/Absegami) took a jet sweep to the right side and scampered eight yards for the go-ahead score with 43 seconds to go. Junior running back Robert Cleveland (Willingboro, NJ/Willingboro)ran in the two-point conversion to put DelVal up three. Sophomore defensive back Anthony Martinez (Woodland Park, NJ/Passaic Valley) intercepted a desperation pass by the Mustangs on the final play of the game to seal the victory. The Aggies received votes in both the American Football Coaches Association (AFCA) and D3football.comTop 25 polls this week. They are first in the MAC in rushing with 309.3 yards per game. That total is also good for eighth in all of Division III. 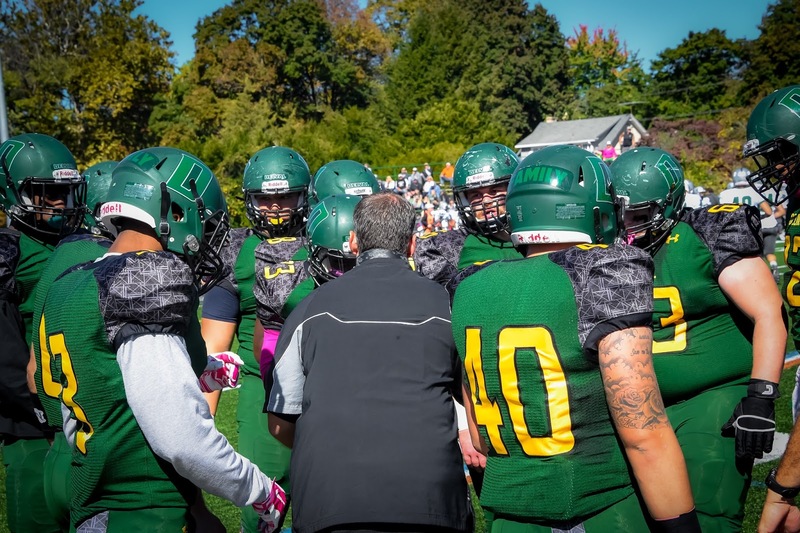 DelVal ranks second in the conference in total offense (429.8 ypg). The running game remains a collective effort, led by sophomores Devauntay Ellis (Ewing, NJ/Ewing) andArmani Fuller-Williams (Philadelphia, PA/Mastery Charter) as well as Cleveland. The trio combined for just 88 yards on 26 attempts and no scores against a tough Stevenson defense but has totaled 1,213 yards on 165 carries (7.4 avg) and 12 touchdowns on the year. Ellis, a junior college transfer, is first on the squad with 507 yards and five touchdowns on 53 attempts (9.6 avg). He netted 64 yards on 12 opportunities last time out. Ellis has rushed for over 100 yards twice this season. Cleveland gained just 17 yards on six carries against the Mustangs but has totaled 374 yards on 62 chances (6.0 avg) and two scores on the year. He had a career-best 162 yards on 16 attempts with two trips to the end zone in the game at FDU-Florham. Fuller-Williams has found pay dirt five times in addition to rushing for 332 yards on 50 carries (6.6 avg). He was held to seven yards on eight attempts against Stevenson. Fuller-Williams hit the century mark with 120 yards on just 11 rushes with a score in the Misericordia contest. Freshman backup quarterback Dashawn Darden (Norristown, PA/Cardinal O’Hara) and Bing have also contributed to the rushing attack with a combined 533 yards on 57 attempts (9.4 avg) and six touchdowns. They were the top two rushers against the Mustangs with 69 and 67 yards respectively. Darden upped his totals to 310 yards on 31 carries (10.0 avg) with two trips to the end zone. Bing has netted 223 yards on 26 opportunities (8.6 avg). He has found the end zone four times. Bing has added 14 catches for 171 yards in the passing game. Freshman Eric Shorter (Trenton, NJ/Princeton) has also reeled in 14 passes for 167 yards. Junior transfer quarterback Danny Farley (Boonton Township, NJ/DePaul Catholic) has been under center for all six contests and has completed 53 passes on 106 attempts for 614 yards. He has yet to toss a touchdown pass. Farley threw the ball 11 times versus Stevenson, completing five for 44 yards. Defensively, the Aggies have held opponents to just 12.5 points per game, which is tied for second in the MAC. They are the conference leaders in rushing defense (99.7 avg) and fourth in total yardage allowed (306.2 avg). DelVal’s numbers in scoring defense and rushing defense rank 19th and 29th in the country respectively. Sophomore safety Shawn Miller (Laurel, DE/Laurel) had a career game against Stevenson, making a team-high eight tackles, forcing a fumble and returning an interception 100 yards for a touchdown. He was named the MAC Defensive Player of the Week for his effort. Miller’s season totals include 41 tackles (good for third on the team), a team-best three pass breakups, one forced fumble and one interception. Seniors Matt Smith (Lansdale, PA/North Penn) and Danny Wynne (Hatfield, PA/North Penn) are the tackle leaders with 49 and 42 respectively. Smith, a linebacker, has produced two tackles for a loss while Wynne, a safety and two-time all-MAC selection, has made 1.5. They combined for 13 stops versus the Mustangs. Senior linebacker Rashaad Lighty (Pottstown, PA/Pottstown) is number one in all of Division III with five forced fumbles in six games. The 2014 all-MAC and all-region honoree is also the team leader with five sacks. Lighty is sixth on the squad with 31 tackles, which includes a team-best seven tackles for a loss. Senior linebacker Ethan Snyder (Catawissa, PA/Southern Columbia) and junior defensive lineman Aric Boyes (Parksville, NY/Tri-Valley) are fourth and fifth on the team with 38 and 32 tackles respectively. Boyes also has one sack to his credit. The two combined for 11 tackles in the Stevenson game. The Lions are one of 20 unbeaten teams left in Division III. They defeated FDU-Florham on the road by a 51-6 margin last week. The game was tied at six with under four minutes to play in the first half before Albright recorded the final 45 points of the contest. The Lions are ranked 16th in this week’s AFCA Top 25 poll and 20th in the D3football.com Top 25 poll. Albright is off to its best start since it won its first eight matchups in 2009. The Lions finished 11-2 that year with their only regular season loss coming at Delaware Valley, who captured the conference title. Albright earned an at-large selection to the NCAA Division III Championship Tournament and avenged the defeat to DelVal, defeating the Aggies in the second round en route to a quarterfinal loss at Mount Union. Offensively, the Lions lead the MAC in scoring offense (39.5 ppg) and rank third in passing (208.7 ypg), fourth in total yardage (361.7 ypg) and fifth in rushing (153.0 ypg). They are 31st in Division III in scoring. Under center is freshman quarterback Mike Knight. He has completed 99 passes in 156 attempts for 1,041 yards with seven touchdowns and five interceptions. Knight is first in the conference in completion percentage (63.5) and tied for second in touchdown tosses. He was 13-of-18 for 171 yards and two scores in the FDU-Florham game. Knight has also added 230 rushing yards on 73 attempts with two trips to the end zone. Albright features a trio of running backs in junior Brian Wickkiser and sophomores Chris Dawson andRoemello Monroe. Wickkiser is the rushing leader with 256 yards on 62 carries and six touchdowns. He is third in the MAC in rushing touchdowns. Dawson has totaled 191 yards on 53 chances and has found the end zone four times. Monroe’s numbers include 46 attempts for 187 yards and two trips to pay dirt. He had his best outing of the season in last week’s game against the Devils, running the ball 17 times for 116 yards and a score. Dawson added two touchdowns and 56 yards on 15 opportunities. The Lions’ top receiver is sophomore Malik Jackson. He has hauled in 33 passes for 312 yards and one touchdown. Junior Vinny Williams and junior Malik Gilmore follow with 22 and 19 receptions respectively. Williams has racked up 240 yards and two scores while Gilmore has totaled 291 yards with one touchdown. Points have been a luxury against the Albright defense, which has allowed just 11.8 per game. That number leads the MAC and is 16th in the nation. The Lions rank third in the conference and 21st in the country in total yardage allowed (273.8 ypg). The unit is second in the MAC and 30th in Division III with 99.8 rushing yards allowed per game. Albright’s bread and butter has been forcing turnovers. The Lions rank third in the nation in turnovers gained (22), fourth in turnover margin (2.17), seventh in passes intercepted (13) and 11thin fumbles recovered (nine). Junior linebacker Kevin Mason paces the team with 43 tackles. He has also forced three fumbles. Mason had a team-high eight stops against FDU-Florham. Senior end Jamal Hayden anchors the defensive line and has recorded 36 tackles, 7.5 for a loss and 3.5 sacks. Senior linebacker Steve Barroso has done it all for Albright. His numbers include 35 tackles, five for a loss, one sack, four interceptions, three fumble recoveries and two forced fumbles. Barroso recovered a fumble and registered an interception last week against the Devils. Linebacker Colton Ryan is another player to watch. The senior is fourth on the team with 32 stops. Ryan also has an interception and a forced fumble to his credit, both of which came last week at FDU-Florham.